ITANAGAR, Dec 24: The Idu Mishmi Cultural & Literary Society (IMCLS) has written to the National Tiger Conservation Authority (NTCA) and the union ministry of environment, forests & climate change (MoEFCC), stating that the community wishes to be consulted during deliberations on the Dibang tigers as the organization has forwarded a cultural model of tiger conservation. The IMCLS wrote the letter following reports that the state government is planning to request the NTCA to declare the Dibang Wild Life Sanctuary (DWLS) as a tiger reserve after the Wildlife Institute of India (WII) submitted its research findings on the Dibang tigers. The WII in its findings says that 11 tigers were camera-trapped in the DWLS and the ‘Mishmi Hills’. “Based on years of empirical research on ecological and social aspects of tigers in Dibang Valley, we strongly believe that the right strategy for Dibang tigers would be to develop a new kind of tiger reserve that is built not with fences and armed patrol guards, but around a cultural model, a culture which has so far proven to be effective in saving the tiger,” the representation read. It said that by acknowledging the important cultural connection between the Idus and tigers, the NTCA and the state government could share a new conservation paradigm with other tiger range states. “We believe that just because tigers are ‘discovered’ in a place, it does not mean it must be declared a tiger reserve without understanding how and why those tigers have survived,” the representation read. PCCF Rabindra Kumar said the department is “conceptually open” to declaration of the sanctuary as a tiger reserve but is yet to make a proposal to the NTCA seeking such declaration. Kumar said the department has not heard from the NTCA recently regarding conversion of the sanctuary to a tiger reserve. However, according to records, the NTCA has written to the forest department twice – in 2014 and 2016 – seeking a proposal from the state government for declaration of the sanctuary as a tiger reserve. Forest officials say that the department is keen to have a tiger reserve as it would enable the department to have more funds to protect the DWLS, and that it is a matter of time before the proposal is sent to the NTCA. The department says that there are only four forest guards serving the entire sanctuary. An official of the department, who did not wish to be named, said that the core area and not the entire Dibang wildlife sanctuary would be proposed as a tiger reserve as the department needs the huge funds that tiger reserve brings, without antagonizing the local community. However, it may not be a smooth ride for the NTCA or the forest department as the local villagers are seeking de-notification of a portion of the sanctuary which falls under unclassified forest land. The government of Arunachal is yet to classify the forested lands of the state, and most of the forest lands are community-owned. The forest department has received a representation from the villagers of Dambeun, Mipi and Etalin-Malinye blocks near the DWLS, seeking reorganization of the boundary of the sanctuary to 2500 sq kms from the current 4149 sq kms. The villagers have written to the forest department following a gram sabha meeting seeking de-notification of a portion of the sanctuary. DWLS DFO Mori Riba said representations seeking delineation of the sanctuary are currently being looked into by the forest department along with the Dibang Valley district administration for forward submission to the Centre. PCCF Kumar said the grievances of the local community would be looked into before putting forward any proposal to the NTCA. State Environment & Forests Minister Nabam Rebia said his department is serious about conservation, and that all possible angles are being looked into. Speaking to this daily, Ginko Linggi, the president of the IMCLS, said tiger conservation has been possible in Dibang Valley because of the local community. “The presence of so many tigers in the valley, which has been authenticated by research findings, is a reminder of the unique conservation model based on deep-rooted cultural values and beliefs of the Idu Mishmis,” Linggi said. He said the Idu Mishmis consider tigers their elder brothers and therefore do not hunt them at all. “If a tiger is killed in self-defence, its funeral has to be organised in the manner the funeral for a deceased human is organised. The rituals and taboos of these funerals are the same,” he said. “The Idu-tiger relationship therefore challenges our understanding of human-tiger conflict and urges us to look beyond one-size-fits-all models for saving tigers in a country as diverse as ours,” Linggi said. (popularly labelled as ‘snow tigers’) occurred outside the DWLS and in community forests, and that the publication makes no mention of how many tigers were photographed inside versus outside the DWLS. They further allege that the articles falsely claim that these are the highest altitude tigers in the eastern Himalayas. “Tigers have been regularly photographed above 4000 and as high as 4200 metres in Bhutan, which is also in the eastern Himalayan biodiversity hotspot,” the IMCLS said. “While Dibang tigers may be the highest altitude tigers in India, this isn’t the only facet that makes them unique. What is truly unique about these tigers, and worth celebrating and protecting, is the exceptional nature of their relationship with the Idu Mishmis, which is the reason these tigers still thrive in Dibang Valley,” it said. The organization further said that the WII study did not take into account the cultural aspects of tiger presence in the area, saying tigers have been present there since long before any research had been carried out. The findings of the two researchers, Aisho Sharma Adhikarimayum and GV Gopi of the WII’s endangered species management department, titled ‘First photographic record of tiger presence at higher elevations of the Mishmi hills in the eastern Himalayan biodiversity hotspot, Arunachal Pradesh, India’ were published in the Journal of Threatened Taxa. According to the published paper, a total of 108 camera traps were deployed across 336 kms with 13,761 trap nights inside and outside the protected area, and the researchers were able to identify 11 unique individual tigers, including two cubs. The research was carried out over a period of three years, starting in 2015. Dr Sahil Nijhawan, who conducted his PhD research in Dibang Valley from November 2013 to September 2015, combining ecological and anthropological methods to study tigers and their relationship with the Idu Mishmis, says that the bulk of the tigers are outside the DWLS. His findings are a part of the IMCLS’ representation to the NTCA. 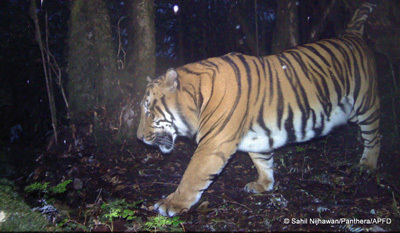 Based on the camera traps (221 locations) deployed in two distinct valleys within the DWLS (total area covered: 472 sq kms) and three blocks in the Idu Mishmi-owned village and community forests outside the sanctuary (total area: 165 sq kms), the findings distinctly show that the tiger density in the community forests is nearly 4.5 times that of the sanctuary, Dr Nijhawan said. Dr Nijhawan said the DWLS’ highland geography makes it insufficient to hold enough tigers on its own to sustain a viable population, adding that more tigers are present in the lower elevation of the valley. Dr Nijhawan said tigers are thriving in Dibang Valley because of the cultural values attached to the tigers. “The Idu Mishmis believe that killing a tiger is akin to murdering a human being,” he said, putting in context the reverence the local community has for the tigers. Next articleIs ‘Arunachal Rising’ a political gimmick?